The degree of land use sustainability (Dos) is the ration index to organically and systematically integrate the degree of ecological friendliness (D EF ), the degree of economic viability (D EV ) and the degree of social acceptability (D SA ), able to comprehensively reflect the whole sustainability degree of regional land use. Based on the value of Dos, the grading system and standard for the sustainability of land use may be established and totally divided into five grades, namely, the high-degree sustainability, middle-degree sustainability, low-degree sustainability, conditional sustainability and non-sustainability. Meanwhile, the standard for distinguishing sustainability grades has also been confirmed so as to determine the nature of sustainability degrees in different grades. This makes the possibility for the combination of nature determination with ration in research result and provides with the scientific guideline and decision-making gist for better implementation of sustainable land use strategy. The practice in evaluation of sustainability degree in county regional land use in Yunnan shows that the value of the degree of land use sustainability (Dos) of whole Yunnan Province is only 58.39, belonging to the grade of low-degree sustainability. Two thirds of counties in the whole province represent the grade of “conditional sustainability” and “non-sustainability” in the sustainability of land use. Among these counties, 11.11 % shows “non-sustainability”. The lowest degree of land use sustainability appears especially in the middle plateau mountain region of Northeast Yunnan, where the value of Dos in most counties (districts) is below 40 %, belonging to the grade of “non-sustainability”. The sustainability degree in the karst mountainous region in lower-middle plateau mountain region in Southeast Yunnan is generally low and the value of sustainability degree (Dos) in most of the counties (cities and districts) is below 55. The value of sustainability degree (Dos) in most of the counties (cities and districts) in the north, west, northwest and southwest parts of Yunnan is below 55. 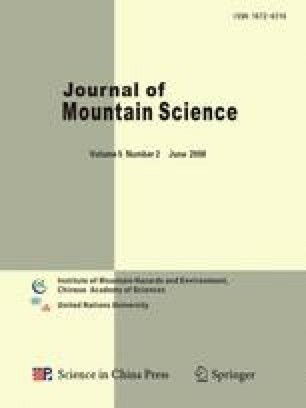 This article also analyzes the reasons of low degree of sustainability in land use in Yunnan and puts forward the countermeasures to increase the degree of sustainability in land use in the whole province.